The fastest way across town is by bicycle as the ambulance service already know. 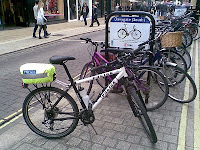 The police too have realised this and there are a number of rugged all terrain bikes (ATBs) to be seen in York decked out in police livery. I must say I'd prefer a z-cars type mark 2 Jaguar but these look pretty cool.